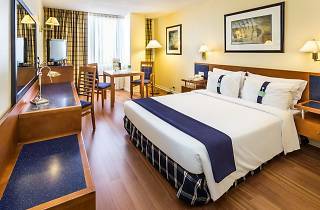 The Holiday Inn sits in a quiet neighborhood near Lisbon’s Técnico university and is handy to the airport. The accommodation is modest and comfy and has some fab city views. Room décor is kept simple with a navy and white color scheme complimented by timber finishes, and features include complimentary tea and coffee and a desk. Standard rooms are comfortable, but those who like a bit of space can book a suite with a separate lounge area. When it’s time for some zzz’s, you can cut the light with blackout blinds and choose your favorite headrest from a pillow menu. The hotel restaurant, Vasco da Gama, serves Mediterranean-style food and traditional Portuguese dishes, while the lobby bar Almirante pours the drinks. Almirante is nice, but you might want to head skywards to the Highview Bar, which has a fine view over the city. Here you can order light meals, ice cream and cocktails (preferably all three). Between May and September, you can take a dip in the pool on the wooden rooftop terrace, and year round you can pump some iron in the small gym with a view. Location: The hotel is in Lisbon’s financial district and is a 15-minute drive from the international airport. A metro or taxi ride is required to reach Lisbon’s downtown area. FIB - il vero gelato italiano: Get your Italian ice-cream fix one kilometre from the hotel at FIB. The creative concoctions include ovos moles (a traditional Portuguese egg-and-sugar sweet) and cream cheese and honey, and there are also vegan options. Mercado de Arroios: This traditional produce market got a facelift in 2015 with new shops and restaurants. Jardim Zoológico de Lisboa: Lisbon’s renowned zoo is three kilometres from the hotel. Here you’ll find a diverse range of animals, including gorillas, elephants, dolphins and lemurs. 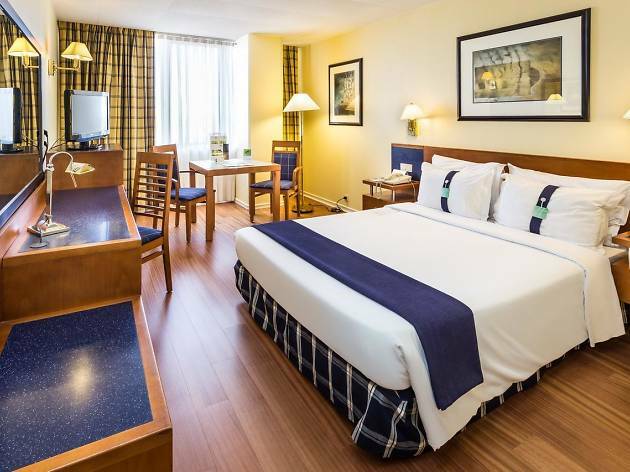 Good for: The Holiday Inn is geared towards business travellers with a 24-hour business centre, but is also suitable for leisure travellers and families, given kids can stay and eat for free. Time Out tip: If you’ve got the family all in the same room, kids can stay and eat at no cost up to age 17. Then if you’re out and about with the young ones, you can feed kids aged 12 years and younger for free at any Holiday Inn restaurant in the city.